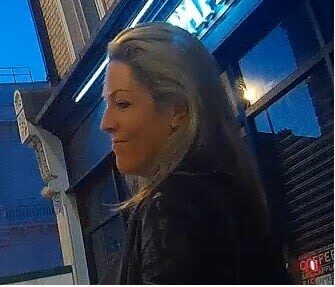 Detectives are appealing for information and witnesses after two women caused more than £1,500 worth of damage to an Uber minicab they were travelling in.At around 4am on Friday, 22 June, two female passengers were travelling in a cab - a white Toyota Prius - from Peters Street, Soho to St Paul Street, Islington.An argument broke out between the passengers and the driver, after the driver asked them to get out of the vehicle as they had cancelled the trip.The two women refused for a prolonged period of time, before getting out at Pentonville Road, where they caused damage to the vehicle by banging on it and pulling the front and rear window wipers.The driver reported the incident to police shortly after, at which point both women fled the scene.A 39-year-old woman was interviewed under caution by appointment on Sunday, 9 September.Police wish to identify the second female [shown in the image, who is believed to have caused most of the damage to the vehicle.She is described as a white female, aged between 20 to 30 years, with blonde, shoulder-length hair. At the time of the incident she was wearing a dark-coloured leather jacket. She is believed to have an Australian accent.